Read on to see an account of one of our fantastic home improvement projects. Here, we helped a local Reading homeowner find a quality, affordable extension. Abbey Windows have over 30 years of experience with installing fantastic double glazing products in homes throughout Reading and the surrounding areas. We are dedicated to working with homeowners like you to make sure that your home improvements go exactly as planned. This particular client selected Abbey Windows for a number of reasons, with our recognition as a Which? Trusted Trader impressing them from the start. We are also proud of our accredited Origin installers, who are trained by the best in the business to install market-leading products. The primary intention is this construction project was to maximise the existing available space with an extension. At the same time the owners wanted to maintain a beautiful view of the garden without suffering from the ‘greenhouse effect’ that can occur in conservatories with large panes. By working with our customer, we realised that an orangery would be the perfect answer to his requirements. 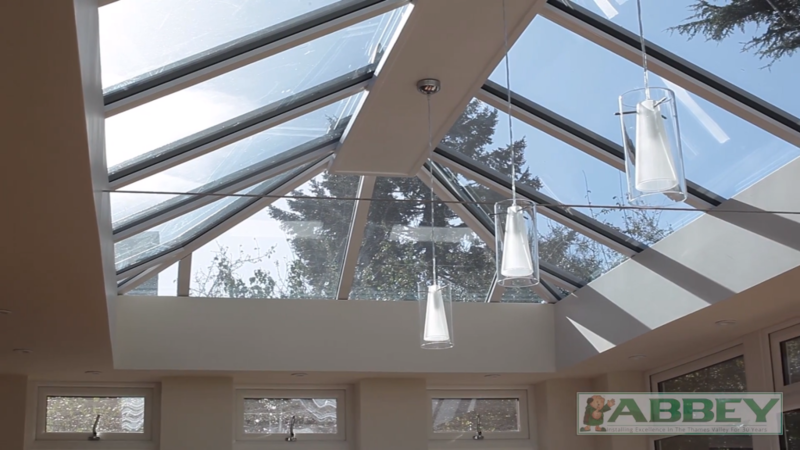 With more of a solid structure and less focus on large window panes, orangeries can offer the perfect combination of natural light and privacy that conservatories and homes cannot. 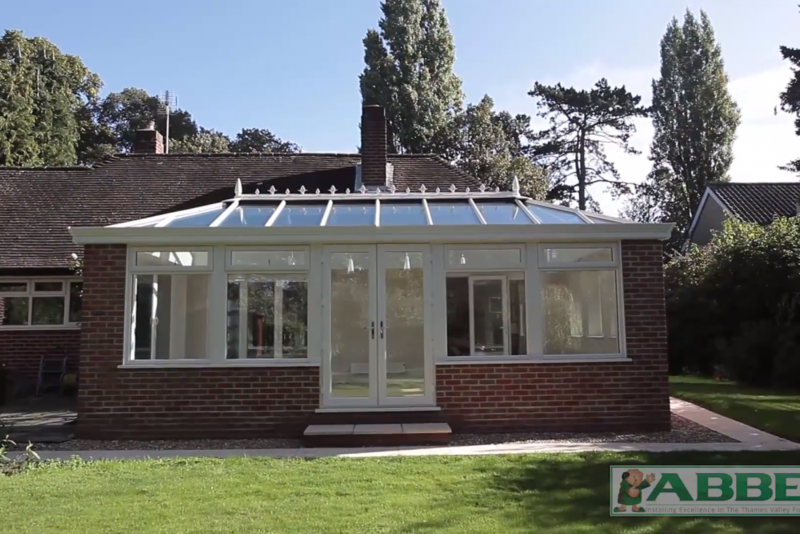 The homeowner was also certain that they wanted to connect the orangery to two separate rooms, which we were more than able to accommodate. This helped to build the illusion of a larger overall living space, and we worked to maintain the living room aesthetic that the customer preferred. During production the homeowners also decided that our aluminium bi-folding doors would be more suitable for their new product that the traditional patio doors they originally had in mind. 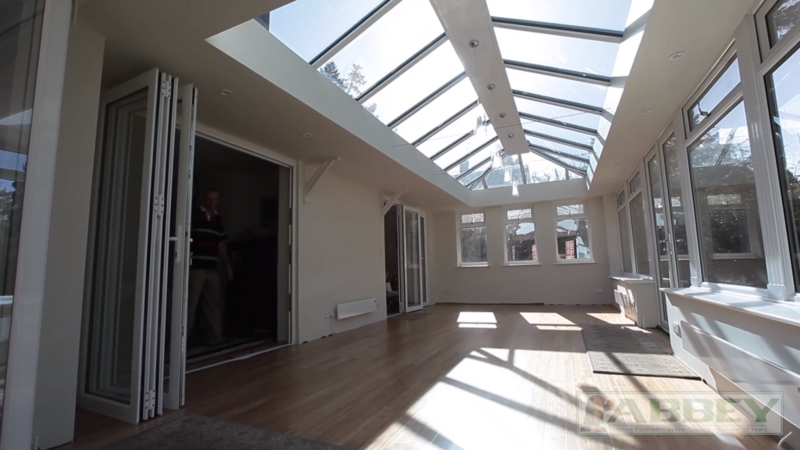 This allowed for an even more spacious feeling, with the orangery blending seamlessly into the patio. The finished product was a bespoke orangery that provides our customer with all of the features and benefits of modern engineering. The perfect summer space for entertaining guests, this new extension manages to blend the privacy of the home with the space of the conservatory. Our installation team thoroughly enjoyed working with this homeowner, who had only good things to say of us. Applauding the team’s efficiency, he noted that he ‘can’t fault any of them. The people who did the groundwork were efficient, clean and tidy…there was minimum disruption to us’. Claiming that he would work with Abbey Windows again in the future, this customer has left our business ecstatic at the quality of his new product. So get in contact with Abbey Windows yourself for orangeries that offer maximum security and incredible thermal efficiency for an affordable price. Abbey Windows have a wealth of experience in installing fantastic double glazing. If you would like to complement your home with one of our incredible extensions then get in contact with our specialists today. Our team will be able to immediately answer any questions you have. If you would like to speak to us on the phone then you can call our support team on 0118 956 6866. On the other hand if you would prefer to submit your query in writing then you are more than welcome to fill out our online contact form. We will respond to any messages as soon as possible. Finally, we also offer an online option for customers looking to begin their home improvement project immediately. 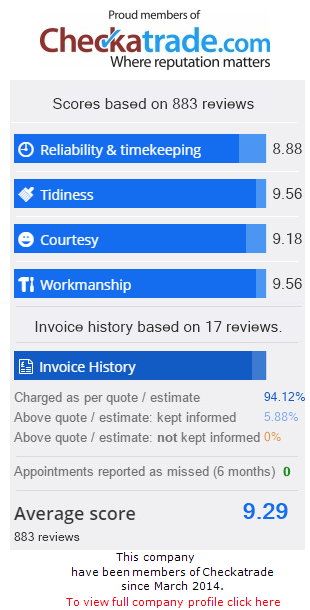 If you fill out our online quotation request then you will receive an instant and bespoke price. This quote will be completely personalised for your project, so try it out today.